While tenured women increase, equity remains a challenge. Three years in the making, the report is the work of the 13-member Provost’s Advisory Committee on the Status of Women Faculty. The committee was launched in 2001, after University president John Hennessy met in Cambridge, Mass., with the presidents of eight other leading research universities—Caltech, Harvard, Massachusetts Institute of Technology, University of Michigan-Ann Arbor, University of Pennsylvania, Princeton, UC-Berkeley and Yale. The nine men convened for the first MIT Conference on Gender Equity in Sciences and Engineering in the turbulent wake of a 1999 MIT faculty study that showed women in those fields routinely experienced discrimination. The overall picture of gender equity on the Farm is “mixed and complicated,” according to the executive summary. For the first time, faculty were asked so-called “quality of life” questions about professional satisfaction, workload and academic climate. 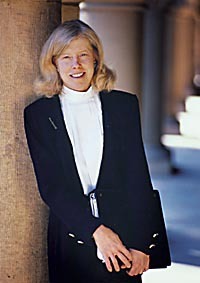 A highly regarded specialist in immunology and the first woman to chair the biology department, Jones has seen the number of women biologists at Stanford climb from one when she was hired in 1972 to 13 today, comprising 28 percent of her department’s professoriate. Jones put discussion of the advisory committee’s report on the agenda at the annual meeting of department chairs and also met with faculty late in September to talk about the findings. Sociologist Cecilia Ridgeway, whom the provost has invited to speak to meetings of department chairs about gender equity and stereotype biases, commends the University’s stated desire to increase the representation of women in the professoriate and to address their professional well-being.